Whether you have a laundry room or closet, it’s usually a space that serves more than one purpose. In my case, my laundry closet also holds the cleaning supplies for the entire house. And as you will see, I have a lot of cleaning supplies. I am always trying new products and comparing them so that I can later share them with all of you. Although I do have my favorites, I like switching them up from time to time and I enjoy the different scents and packaging. In a few days, I will share how I maximize the space in my laundry closet but for now, I want to share general tips for getting any laundry area in good shape. So let’s get ready to PURGE, CONTAINERIZE and of course, DECORATE! Clear out the laundry room and separate like-items. The laundry room can easily become a catchall space for the whole family, similar to a mudroom. Start by clearing out the space and separating the items into sections. If you have a few empty laundry bins, they are perfect for containing the contents of the space while you decide what to keep and what needs to go into another room. Sometimes it’s best to start with a blank slate so that you can better imagine the best placement for the items that you are keeping. Designate the space for your needs. Keep the products that you use most at eye-level. I keep my detergents and oxy powder cleaners right on the washer, inside of a metal tray. 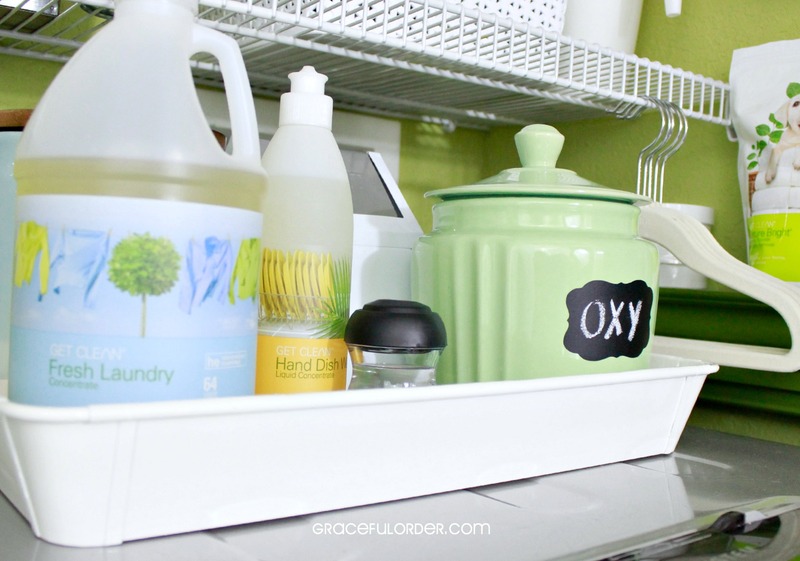 Adding a tray will not only make the items look neater, it is also keeps the residue from the bottles from getting all over the washing machine. If you keep your cleaning supplies in the laundry room, designate plastic bins to keep them contained. I like plastic bins because they keep items from toppling over if you have wire shelves, like mine and they are easy to clean from spills. 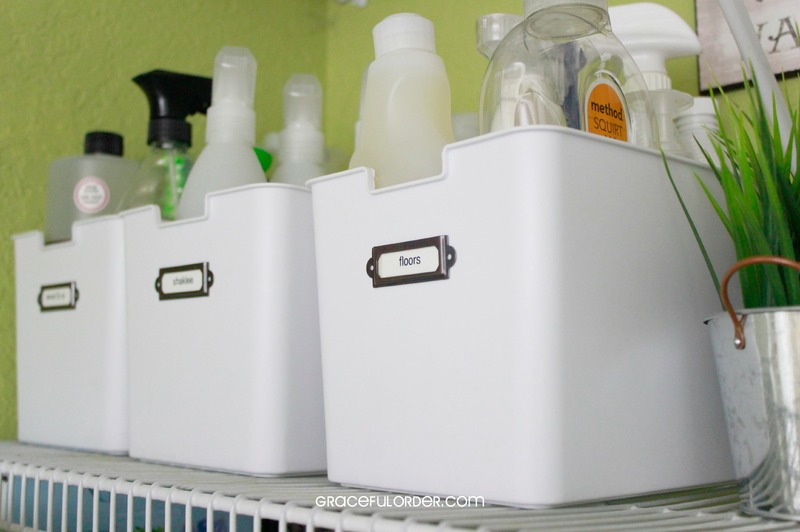 I use these open-top bins from Target and they each hold products for different cleaning tasks. I added a stick-on label that you can find here and they are both functional and decorative. 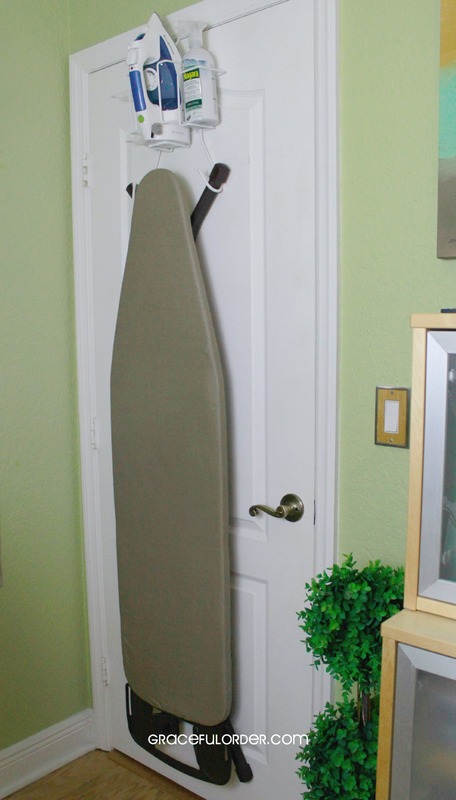 Since I have a laundry closet with bi-fold doors, I don’t have the space for an ironing station in the laundry area. I keep this over-the-door organizer in another bedroom which is where I iron. If you have the space, you can use this set-up behind a cabinet door or create a station right on the wall. I like the organizer below because it stores the products together with the iron and the board. 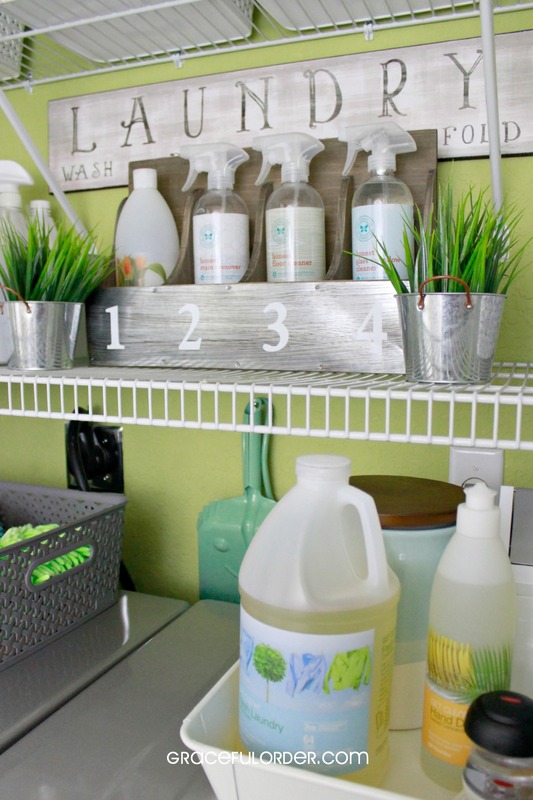 Keep the laundry room looking crisp and clean and it will make laundry so much fun bearable. Use a comfortable, pretty rug in front of your washer and dryer, hang some laundry related art on the wall and add a faux plant for some color. I would love to hear from you some feedback about this organizing series. What rooms have you tackled? What’s next on your list? This is really beautiful and elegant. I already loved your old laundry set-up, I think it’s the unbeatable example of how to put a LOT of stuff in a small space and still look great. This is very soothing and peaceful to look at. I love the look of your shelves. What an inspiration! Where did you find the ‘woven’ plastic basket? I love them. The woven plastic baskets are from Target. I would love to know more details about the items that you used: paint color, “1-2-3-4” bin, light green “oxy” container, “laundry” sign–I love everything about this makeover! Any additional information or links you may have would be wonderful! Thank you! The color is Lemongrass from Sherwin Williams. You may be able to find the 1-2-3-4 bin at Homegoods, the laundry sign and the oxy container are from World Market. I purchased the oxy container over a year ago and it was called “Mint Scalloped Jar”. Hope that helps! Everything flows with such elegance. From the colors, the crisp white baskets and the shelves. Thanks for the inspiration, Maria. Where did you find the half size solid white bins, the ones with the label that says “floors”?!? I have been watching Target like a hawk for similar one from 18 months ago to come back in and haven’t found them. I need them for my daughters’ closet. Love the make-over! I love those bins! I recently saw them at Target in the translucent color, but I haven’t seen the white ones in a long time. They are called ITSO bins. 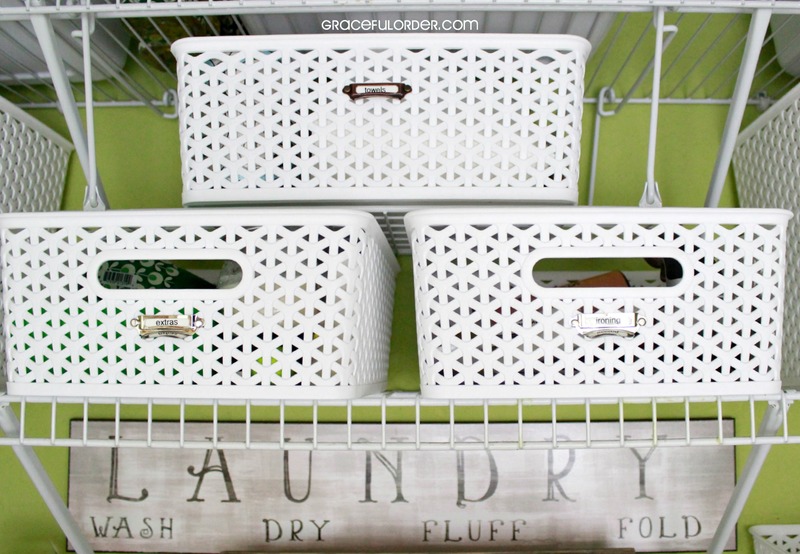 I love how you organized your laundry room! I need to organize my home’s laundry room!